Over the years the gear in my hunting pack has grown ridiculously out of control. From my observations, this seems to be the case for most outdoorsmen. If you don’t agree with me, just watch a SHWAT™ Pro Staffer pack for a one day hunt. It looks like we are preparing for the movie Red Dawn to become a reality. I tend to lean towards the ideology that one is none and two is one. It only takes one hunt to be ruined by a broken or missing piece of equipment for a hunter to learn their lesson. Over the years I have been well educated on this myself, but my learning hasn’t stopped there. I’ve come to the conclusion that I need to be prepared for the inevitable, but at the same time I don’t need all of the gear I own with me at all times. I just need it in reserve, and back at camp or in the vehicle is accessible enough. Herein lies the problem though. I opened this story about my out of control, heavy, and cumbersome hunting pack. This is a mystery I have only recently solved. As you sit here reading this story, I am sure you are thinking that there is a simple solution. Just pack the bare necessities and leave the rest at camp. HA! If it were only so easy! You see, as humans if there is a pocket to be filled, we will fill it. Don’t believe me? Just take a look at a man’s wallet or a woman’s purse. They are filled to the brim and bursting at the seams aren’t they? So, for me the problem boiled down to the pack. It was time for it to go or I would just keep filling it up and wear myself out lugging it around. Before we go any farther I need to state, for the record, unlike Pro Staffers Eric Conn or Amy Rutzen, I am not on multi-day Elk hunts where I backpack deep into the Rockies. I am always within a mile or two of a truck as I chase down Texas game. My solution came to me at SHOT Show 2019 after speaking with Mike Semanoff who does gun industry public relations. The answer was High Speed Gear, Inc. I have to admit I am a bit of a Tactical Timmy and have been using HSGI gear for a few years now. Half an hour before writing these words I finished reconfiguring my HSGI Battle Belt and Mag Taco’s for a CQB Course I am in this Saturday. 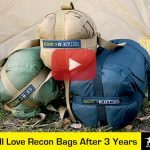 Their gear is top notch, battle proven, and 100% made in the U.S.A. I have always loved their products, but I never thought about using it in a hunting scenario until Mike got me thinking about it. At first, I wasn’t sure, but the more I thought about it the more it made sense. So, with that I attempted to configure the ultimate hunting belt and ultimate hunting chest rig on my recent coyote and prairie dog hunt in the Texas Panhandle. First, pair down the gear I keep in my pack to the essentials I need to keep on body. Second, configure a belt rig and chest rig to contain said equipment in a defined and organized manner. Sometimes, in predator hunting you only have a few seconds, and when I need something I need it immediately. There is no time to fish through pockets or packs. 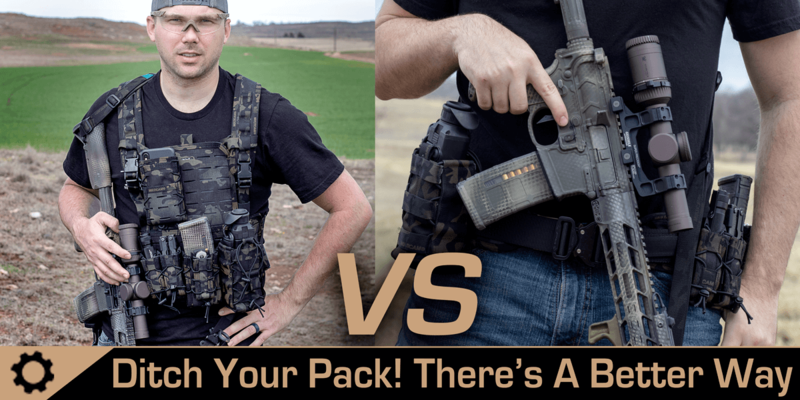 Finally, I wanted to test the belt and chest rig setups independently on separate days and nights to get the pros and cons of each. I decided the following items were the ones I could not go without. One notable mention that I left out on this list was a trauma kit. We are often hunting in the dead of night under night vision and thermal optics. We preach safety first, but accidents can happen and I believe in being prepared. So, why did I leave it off the list? If this were a pig hunt where we were moving further away from the truck, it would be on me. Since we were never more than 30 yards away from the truck, I felt comfortable leaving the HSGI O3D Medical Pouch on the dash. For those who are curious, I had it loaded out with a compression bandage, combat gauze, chest seals, NPA, and CAT Tourniquet. The great thing about High Speed Gear pouches is their ability to hold just about anything. They are extremely adaptable and versatile. I decided to configure the belt and chest rig with the same gear in order to not skew my opinion. The belt I chose for this mission was the HSGI Laser Slim-Grip Padded Belt. The chest rig was the HSGI Neo Chest Rig. Here are the pouches I chose and what they held. I loved it. Everything had its proper place and I wasn’t left with unnecessary space that I would needlessly fill. Not only was I able to quickly access what I wanted to without searching for it, I was able to do it quietly. The biggest win for me was using the Soft Taco to hold the Pulsar Helion. Due to the influence of fellow Pro Staffer, Jared Hilton, I can’t seem to go hunting without that thing any more. The problem I would run into with it was where do I put it when it’s time to shoot. It is too big for my pockets. To put it in a backpack I have to take off the pack and unzip it; that’s too loud and too slow. When I tried to use the lanyard loop it would annoy me by flopping around and eventually make noise by clanking on my rifle. So, what I would end up doing was sitting a $4,000 piece of equipment on the often muddy ground in the middle of the night. Not very smart. The Soft Taco held the Pulsar securely and I was able to get it in and out of the pouch quickly without fiddling. Jared will be jealous and I give it one hunt before he breaks down and gets a taco for himself. If you knew Jared, you’d find that particularly funny. The big question is what is the ultimate hunting setup? The belt of the chest rig? Well, I came to the conclusion that it depends on what you are doing. If you are doing a lot of walking like we do when we go hog hunting, I think the belt wins hands down. It’s more streamlined when you are on foot and you have less to get in the way of a slung rifle. If you are spending a lot of time in a vehicle or in a sitting position, the chest rig is much more comfortable. We spent a lot of time on this hunt driving from field to field and calling coyotes from the truck. The chest rig kept everything accessible without me having to twist and turn to pull things out from behind my back like I would from a belt. 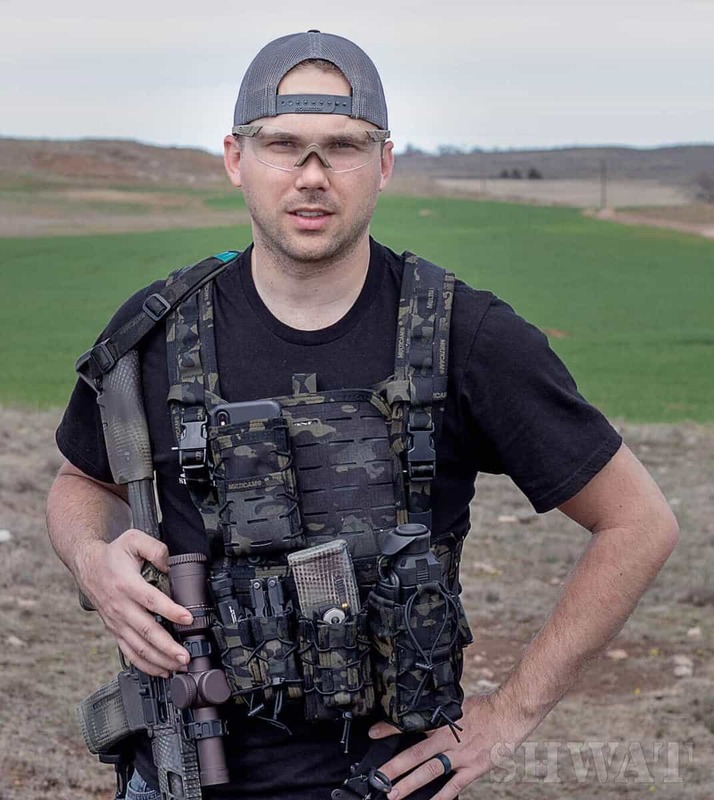 Honestly, I thought the chest rig setup was going to be cumbersome and goofy, but it was actually extremely practical for the type of varmint hunting we did that weekend. My HSGI rigs will now be a staple on many of my hunts. I already have a dual Dump Pouch setup in mind for this coming dove season. One for the shells and one for the birds. High Speed Gear is like Legos for the outdoorsman. You are only limited by your imagination. So, in conclusion, I recommend dumping that big pack and getting with the times. It really is more efficient and it falls right in line with rule number one: Always look cool. Also, start paying attention to the SHWAT™ Instagram. You just might pick up on a few ways we are using some of this equipment to stay on the cutting edge. Otherwise known as Special Hunting Weapons and Tactics™. This entry was posted in The Hunt Junkie and tagged Coyote, Gear, Gear Review, High Speed Gear, HSGI, Hunting, Prairie Dog by Casey Jones. Bookmark the permalink.